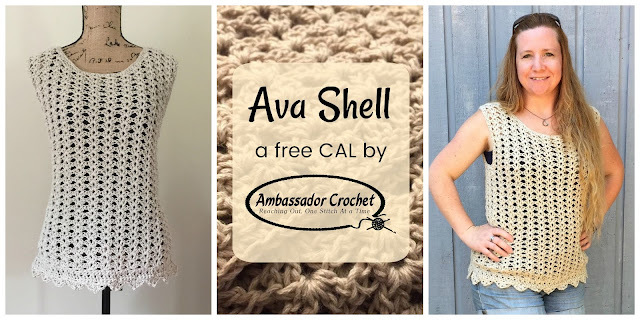 Welcome back to the Ava Shell Crochet-a-Long! If you're just joining us you can get all the info about the CAL, including a complete schedule and links to previous posts HERE. This week you'll be working the front of the Ava Shell. The pattern is worked from the bottom up, so this week you'll work from the waist up to armpit. You'll stop at the armpit so we can save the armhole shaping for next week. Here's a little sneak peek of what the stitch pattern for the main body will look like. Summertime is here! We're going to be making a lacy shell/tank top which is perfect for over a tank top of swimsuit. The shell was designed to be a good top for those who have never taken on the challenge of a garment, but it will be great for any level crocheter. I highly recommend blocking, but I know many of us don't follow that part of the instructions. With that being said, gauge is critical to getting this to come out the right size! I did a gauge swatch with 3 different brand yarns and 2 of them had to use a different hook size other than the one recommended to match the gauge. Note: The sample in the photo was made with a linen/cotton blend yarn, but we also swatched a cotton yarn, as well as an acrylic yarn. You can substitute other yarns, but please swatch this to make sure you don't end up with a shell that is 2 sizes too small. Cotton will block easily, so if you choose cotton and your gauge is only slightly off, blocking will work. If you don't plan on blocking - and know this ahead of time - make sure you get gauge! Below are some resourses that will help you pick out a yarn that you will be happy with. 5 Tips for Choosing a Yarn Substitution - Things to consider when substituting yarn. Tips for Substituting Yarn - What to look for on the yarn label. The link to the actual pattern instructions is here: Ava Shell CAL. Aug 30th: Giveaway deadline (11:59pm, EST). Winner to be announced Aug. 31st. Head over to the Ava Shell post for yarn info, gauge swatch, and more. Don't forget to join the fun in our CGOA CAL group on Facebook. You can also ask questions and connect with others that are working the CAL in our Ravelry forum thread. If you want to share photos of the CAL on social media, please use the hashtag #CGOACals so we can see everyone's progress. We will be adding our sponsors and giveaways shortly. Please come back soon to check them out! 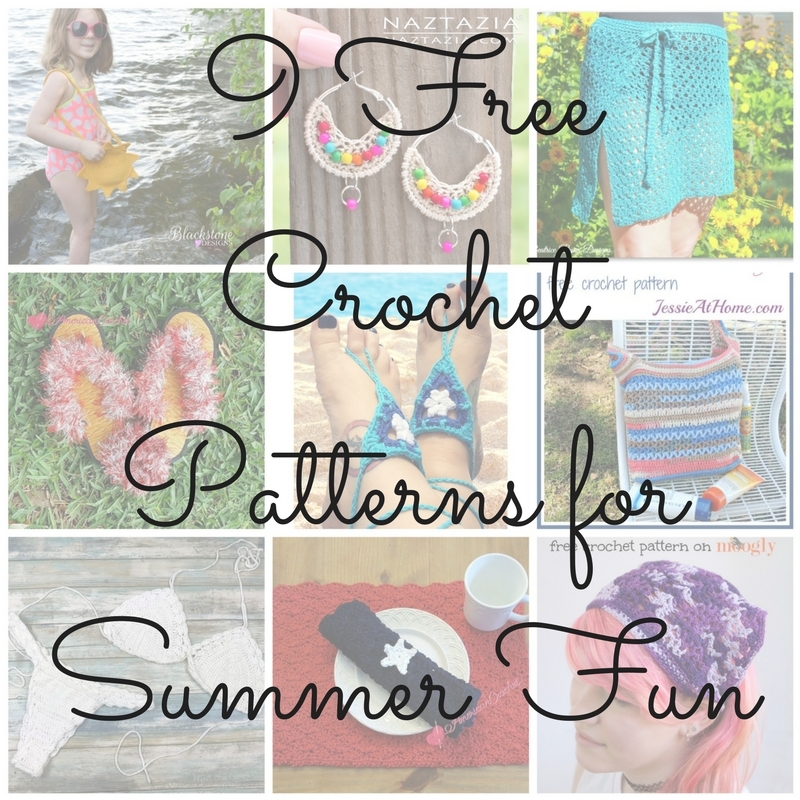 This month’s roundup features 9 free crochet patterns women's and children's accessories and picnic decor by our talented designers. Photos are used with permission. Enjoy! Lace crochet is ideal for sweltering, summer days, when you don't necessarily want a heavy or warm project on your lap. Easy, Breezy, Crochet Lace is a fantastic collection of lace patterns, brought to us by Crochet! Magazine. 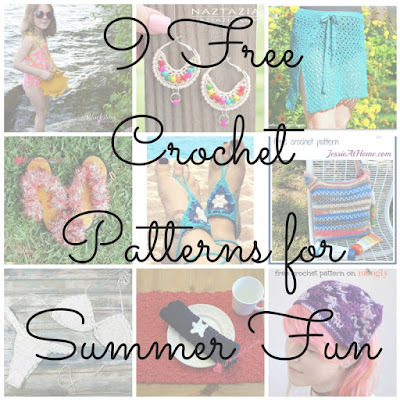 It features over 35 designs, all excellent choices for summer crocheting. If you're on the go this summer, try one of the designs from the "Little Lace Treasures" section. These projects are all smaller items, so you can easily throw them in a bag and take them with you while you're out and about. Best of all, they work up quickly, so you'll be wearing that pretty Shades of Spring cowl and darling Dragonfly Lace Hat in no time! One of the things I love about lace is the "wow" factor. Lace designs have a way of looking so intricate and detailed, even when they're not. The New Looks in Lace section is full of show-stopping wearables that are sure to turn heads. Most of the cute tops, shawls, and shrugs in this section would be great for spring or fall. Personally I would wear many of them even in the middle of winter, layered with warmer clothing. The Trellis Tee in particular caught my eye. It's a beautiful wear-to-work look all on it's own but would also look fabulous with a jacket...and it comes in my size! Big, bold motifs take center stage in the next section, Exploded Lace. There are single-motif patterns like the Garden Lace Rug, as well as patterns that combine motifs. Bobbie's Lace Wrap, made up of large flower motifs and smaller leaves, is definitely a statement piece! If tops and shawls aren't your thing, don't worry! Whatever type of project you prefer, you'll find something to love in this collection. There are several jewelry patterns, home decor items, and more! Make any living room just "beachy" with the Trade Winds Throw and Sunburst Pillow. Or start on holiday gifting with pretty, Potpourri Pockets and Candle Shadows jar cozies. With so many patterns to choose from, you'll be making lace all year round! Enter to win your own digital copy of Easy, Breezy, Crochet Lace! This prize is generously provided by the publisher, Annie's Signature Designs. To be eligible, you must be 18 years of age or older, with a valid email address. The winner will be contacted by email to confirm the email address, and must reply to that email within 1 week in order to receive the prize. If the winner does not reply within 1 week, a new winner will be selected. The giveaway ends on August 4th. Hurry and enter below! Disclaimer: A free review copy of Easy, Breezy, Crochet Lace was provided by Annie's. Although I accept free products for review, I do not accept additional compensation, nor do I guarantee a positive review. My reviews are based entirely on my honest opinions. All images of copyrighted material are used with permission.